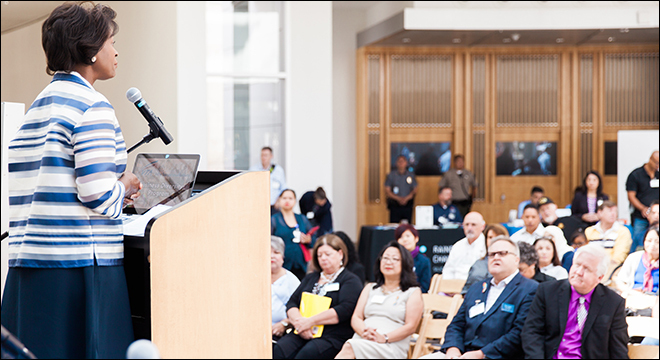 Over one hundred Bay Area business owners and employees gathered at San Jose City Hall to attend the Valley Transportation Authority (VTA) Business Diversity Program Expo hosted by VTA and Silicon Valley’s Minority Business Consortium (MBC). 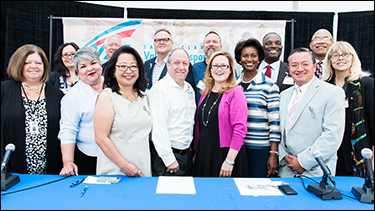 The event kicked off VTA’s newly expanded Business Diversity Program (formerly known as the Minority & Women Owned Business Enterprise Program), which was recently broadened through a unanimous vote to include disabled veteran and lesbian, gay, bi, and transgender business enterprises. This historic decision marks the first time in the history of the United States that a government transportation agency has adopted the inclusion of LGBT businesses into their policies and procedures. VTA board member and Santa Clara County Supervisor Ken Yeager, Santa Clara County’s first openly gay official, worked closely with MBC to make this historic change happen. Their work together began in 2014 before the passing of Assembly Bill 1678, which classified LGBT owned businesses as disadvantaged, giving them access to provisions previously offered to businesses owned by minorities, women, and veterans. A similar California law was passed for disabled veteran owned businesses in 1989. Yeager and MBC not only worked to expand the effectiveness of VTA’s outreach and certification, but also held various outreach events engaging the LGBT and disabled veteran business communities and giving them a platform to advocate for their inclusion in VTA’s diversity program. On May 5, 2016, the VTA Board of Directors voted on the addition of these communities to their diversity program. MBC spoke in favor of the expansion, as did members of several advocacy groups, including members of Working Partnerships and the Disabled Veteran Business Alliance (DVBA).The vote was unanimous, and the Business diversity program was expanded. After passing the change to the program, MBC’s next step was to bring these communities together with VTA. Through community engagement and various other outreach methods, MBC was able to connect VTA to business owners throughout the San Francisco Bay Area and invite them to the June 14th expo, which featured representatives not only from VTA, but also from the City of San Jose and Santa Clara County. Each agency offered a look at their upcoming contracts, and provided attendees with advice on how small and disadvantaged businesses can approach seeking business with them in the future. Many business owners and advocacy groups in both the LGBT and disabled veteran communities attended the expo, including Mike Sabellico, executive director of the DVBA. “We celebrate VTA joining the state of California in recognizing that disabled veterans deserve special consideration for suffering permanent disabilities as a result of their service to our nation and helping them compete more effectively for contracts and share their expertise for the good of all,” said Sabellico. The expo was supported by City of San Jose, Small Business Alliance, Rainbow Chamber Silicon Valley, Disabled Veterans Business Alliance, Billy DeFrank LGBTQ Community Center, Santa Clara County, Office of LGBTQ Affairs, Department of Governmental Services, Golden Gate Business Association, Silicon Valley Business Journal, and MBC. For more information, please contact MBC at (408) 660-9171.